Tim Burton's visual imprint—the skewed, German-Expressionist spaces, which are designed either in gothic black or striking bursts of primary color—has been unmistakable from the start, but he's also been telling the same outsider story for 20 years. From Pee-wee Herman to Batman to Edward Scissorhands to Willy Wonka in the new Charlie And The Chocolate Factory, the Burton hero has always been a sensitive loner who's both distinguished and isolated by the grand, whimsical ideas that set him apart from everyone else. This kind of stress can be wearying, and the years have taken their toll on Burton, who has never quite rebottled the bright, funhouse energy of his first two movies, Pee-Wee's Big Adventure and Beetlejuice. For all its whimsical delights, Big Fish feels like a long, middle-aged sigh, and Charlie And The Chocolate Factory seems to move just a beat behind Roald Dahl's beloved novel, however faithful and sumptuous the adaptation. In many respects an improvement over the 1971 stoner classic Willy Wonka And The Chocolate Factory, Charlie opens with a flourish, as poor London boy Freddie Highmore joins a frenzied bid to gain entry into Willy Wonka's mysterious factory. After spies from competing candy manufacturers ripped off his wondrous confections, Wonka (Johnny Depp) fired his employees and retreated into the giant facility, only to miraculously reopen for business years later. 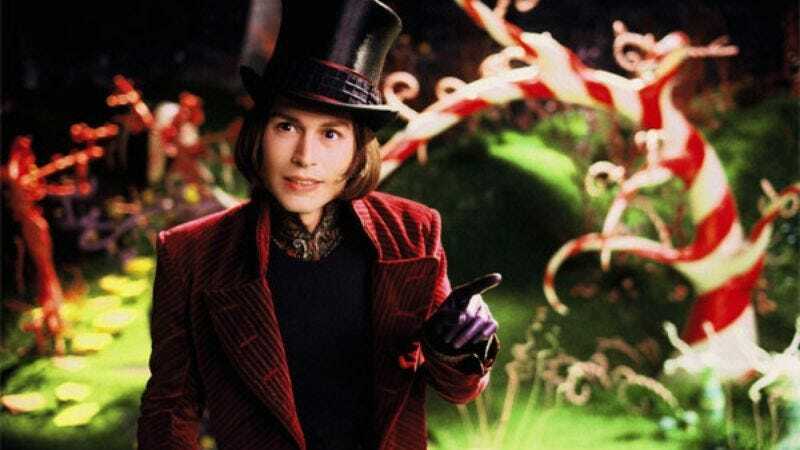 When Wonka inserts five "golden tickets" into his chocolate bars, offering the lucky winners a daylong factory tour, the world erupts in Wonka fever, which even extends to the wide-eyed Highmore, whose family can only afford to give him a candy bar on his birthday. Needless to say, Highmore beats the odds and brings his spirited grandpa (David Kelly) along to join four spoiled, obnoxious brats and their parents on the Wonka tour. Cleverly departing from Gene Wilder's more theatrical turn in the 1971 version, Depp adds to his growing list of lovable eccentrics, playing Wonka as a frightened man-child who approaches kids tentatively, like they're some strange, alien species. Like many people who've become resigned to going it alone, Wonka gets his only source of happiness from his own runaway imagination, and Depp's beaming grin makes it easier to swallow the miscues, such as an Oompa-Loompa crew that sings and dances like an amusement-park revue. There's little wrong with Charlie, but it needs the Burton of old to animate its candy-colored universe with mischief and awe. Instead, he remains trapped like Wonka in a hermetic house of wonders, and the movie suffocates along with him.